Thursday, December 12, 2002 I arrived at Ellie’s house around noon and was greeted by five happy hounds; one of them being Smokey who was just a week and one-half shy of celebrating his 12th birthday. As greyhounds go, Smokey is not the most attractive specimen. He is (and I do hope Smokey takes no offense here) one of the silliest looking hounds I’ve ever met with a coat that resembles rabbit fluff and has a hint of a curl to it. Smokey has a history of epilepsy and hypothyroidism and is easily spooked. But he melts my heart with his goofy antics, prancing through the house, carrying a toy with his head held high as if he wants to share it with me. But he’s too shy to overtly drop it in my lap. On this afternoon I noticed Smokey had mud on his backside. Ellie decided he must have slipped in the yard during his enthusiastic romp to the door to greet me. Ellie cleaned him up and we checked him for cuts, bumps and bruises. We cleaned up a small gash on his front leg and we agreed it would probably heal nicely without sutures. With Smokey now cared for, Ellie and I went about our business of going through photos. Several hours later, as I was getting ready to leave, Ellie and I checked Smokey again who was snoozing on a bed in the dining room. His gash was nicely scabbed. I checked the color of his mucus membranes. His color looked good and his Capillary Refill Time (CRT) was normal. I felt assured that he would be fine. “He’s going to be sore in the morning,” Ellie predicted. I suggested giving him a buffered aspirin after dinner to help alleviate any discomfort and stiffness he might feel in the morning. Late that afternoon my phone rang. “He’s not doing well,” Ellie reported. “He seems uncomfortable and slow.” There was a fleeting thought that ran through my mind – Had Smokey injured his spleen in the fall? I dismissed the thought. His color was fine when I left so I was almost certain he just had muscle stiffness. I suggested that Ellie check the color of his gums. She reported they looked fine. They were pink and aside from some periodontal disease that Greyhounds are noted for, they looked normal. It is not easy to injure a spleen and my thoughts wrestled the possibility versus the probability. The spleen is tucked up nicely under the lower ribs for protection. Satisfied that his color was fine, I again dismissed the thought that his spleen was ruptured. Had he ruptured his spleen several hours earlier, he would certainly have pale mucus membranes (gums) by now. I told Ellie I would contact Dr. Matz. Even though our veterinary hospital is closed on Thursdays, I knew that if Dr. Matz were available, she would see Smokey if he needed to be seen. I was still in the frame of mind that all Smokey needed was a good anti-inflammatory and perhaps an antibiotic. I was certain that some restricted rest time would have Smokey back to his silly old self. Yet, there was that nagging feeling that this older greyhound might possibly have a major problem. I called and reported the events to Dr. Matz, who was concerned about a possible injured spleen. I assured her that I had checked Smokey’s CRT as did Ellie and that he looked fine. Dr. Matz then called Ellie and together they decided that Smokey should come into the hospital in the morning for an exam. In the meantime, Dr. Matz instructed Ellie to call if Smokey’s condition changed. Things seemed settled. About 9:30 that evening Ellie called me to report that Smokey did not look at all well and she was concerned. Knowing that Ellie was not an alarmist, I told her to call Dr. Matz at home and to call me back. A few moments later she called to say that she was going to take Smokey into the hospital now and that Dr. Matz would meet her there. Ellie was worried that she would not be able to get Smokey into the van so I offered to meet her at the house to help her load him. I later learned that while Ellie was on the phone with Dr. Matz, Smokey was trying to vomit. The abdominal contractions produced when Smokey wretched could cause any internal bleeding to become worse. Smokey was lying in the dining room when I arrived. He showed neither enthusiasm nor apprehension when I approached him. I looked him over and saw that his gums were pale and his CRT was slow. He was in shock and needed to get to the hospital quickly. Dr. Matz was waiting for us when we arrived. “How is he?” she asked as she opened the door. “In shock,” I reported. Dr. Matz and I had worked together in an emergency clinic years before, so I was familiar with her proficient and systematic examination With certainty in her voice she began to explain to Ellie what was going on with Smokey and what we needed to do to fix it. Smokey had blood pooling in his abdomen (hemoabdomen). Within minutes Smokey had two IV catheters placed, one in each of his front legs and was hooked up to fluids and we drew blood from him to help evaluate his condition. As I ran to the lab to start the CBC and Chemistry, Dr. Matz wheeled the ultrasound equipment and ECG monitor to where Smokey rested. The ultrasound confirmed fluid in the abdomen. An abdominal tap confirmed that it was blood. The ECG machine beeped as Smokey registered Ventricular Tachycardia, so much to his dismay, Smokey was started on oxygen therapy. Ellie held his nose in a mask that carried the oxygen to his lungs with each breath he took. Dr. Matz started a list of items we would need to save Smokey and we checked off what our hospital had in stock and what we would need to obtain elsewhere. In emergency practice, there are certain items that are routinely in stock that a “day” practice would not necessarily carry. Oxyglobin is one such item. Our hospital is situated between two emergency practices. We were certain that whatever we needed we could purchase from one of these hospitals. Transporting Smokey was out of the question; he would not survive traveling even a short distance in his condition. One thing was clear, we needed to stop Smokey’s internal bleeding or at best, reduce it. And we needed to regulate his heart. This needed to be accomplished before anyone could leave to get supplies. Together, the three of us worked on the floor where Smokey lay. He was given a Lidocaine injection to help abate the tachycardia. Then Ellie and I precariously held Smokey as Dr. Matz wrapped his abdomen with a compression bandage. With the compression bandage in place, the ECG monitor tracking his heart rate, an oxygen mask over his nose and IV fluids pumping into his veins, we could do nothing else until we obtained the supplies we needed. Dr. Matz left Ellie and me to watch Smokey while she obtained supplies. She gave us instructions and locked the door behind her as she left. Smokey’s condition had changed little by the time Dr. Matz returned despite the efforts already applied. We added Hetastarch to Smokey’s IV cocktail. There was no available blood from the emergency clinic and Smokey was losing blood rapidly, he needed a live donor and he needed Oxyglobin. 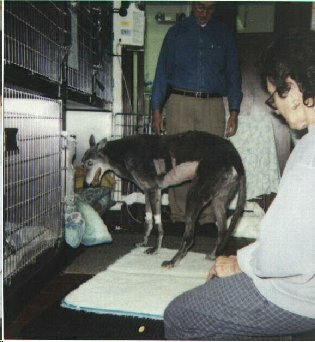 Ellie ran home to get Nikki, Smokey’s first greyhound donor. Dr. Matz injected Smokey with Benadryl and a steroid while we waited for the donor to arrive. A transfusion can cause an anaphylactic reaction and the Benadryl would help prevent that. Although Nikki had never donated 500 mls of blood before, she did it well. Smokey was quickly started on his transfusion and because there was no time to cross match the donor and recipient blood types, we watched and waited, hoping that there would not be an anaphylactic reaction. With the transfusion started, Ellie and I left to drive a half hour to get the only available Oxyglobin from an emergency center in Stratford, CT. When we returned to Smokey about 2:00 AM we dragged out dog beds and blankets, some for Smokey, some for ourselves and settled in for a long wait. We watched the IV drips and the ECG monitor and Smokey. There was nothing more we could do. The night began to get blurry. Some time during those hours, the donated blood had been completely transfused into Smokey’s veins, he was put on Hetastarch and the IV catheter in the other leg continued to drip with Normosol. As the sun began to rise on Friday, the 13th, Dr. Matz returned to her home to get her children ready for school and Ellie went home to take care of her other hounds. I stayed until Dr. Farrell came into work so I could brief him on the night’s events. Smokey’s condition had improved only slightly and he was far from stable. The ECG monitored displayed multi-focal Ventricular tachycardia, the oxygen mask helped to get oxygen to his lungs. Smokey was resting as comfortably as he could manage and I went home to a long hot shower before I returned to work. Back at the hospital Smokey’s conditioned worsened, his PCV dropped continually after the transfusion. By noon, Smokey showing signs indicating he was “in DIC,” an acronym for Disseminated Intravascular Coagulopathy. Basically, this means that while Smokey’s body was trying to stop its own bleeding, the formation of clots in circulation consumes the clotting factors and platelets to such a degree that it actually leads to more bleeding elsewhere. Smokey had red bruising on his skin known as petechiae. DIC means — Death Is Coming. Smokey needed surgery and another blood transfusion to save him. For a second blood transfusion, we needed to find a donor whose blood type matched Smokey’s. 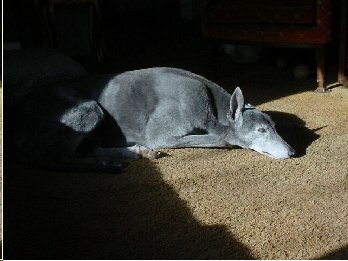 We called on Marcia Herman’s young greyhound, Cullen. We drew samples of blood from Cullen and Smokey. I called the Lab technician at one of the emergency hospitals to see if he were able to type the blood for me while we began to prepare Smokey for his surgery. He was happy to do this for us as well as supply us with some necessary items that we would need. Marcia and Ellie delivered the blood samples and picked up the supplies while Dr. Farrell and I prepared for surgery. Shortly before 2 p.m., Smokey was on the surgery table. Shortly after we began, I received the bad news. Cullen was not a match for Smokey. We needed to find a new blood supply. The other emergency clinic agreed to sell us one bag of plasma. Robin Kennedy, (a friend, client and greyhound owner) was in the hospital at the time picking up items she needed for her own hounds. She wanted to help so we sent her to the next town to pick up the one bag of plasma available to bring Smokey out of the DIC. As a surgeon, Dr. Farrell is confident, systematic and composed. I’ve assisted Dr. Farrell in countless surgeries over the years but I am exceptionally pleased about this one. There was a cystic like mass that had ruptured. The spleen was bleeding into the abdomen. Without hesitation, Dr. Farrell clamped off bleeding vessels, and removed the spleen. This was not quite as simple as it sounds but the proficiency by which it was accomplished made it seem so. With the mesenteric cavity open, the surgeon evaluated the other organs. Kidneys, liver, bladder, intestines, pancreas all seemed to be in fine condition. With great relief, he began to close the surgical site. Smokey was cradled in heating pads in his post op recovery cage from which the door had been removed to give us quick and easy access. A urinary catheter was in place. Now, all that could be done was watch and wait. We watched the plasma drip into one of Smokey’s catheters. Through his other catheter dripped Hetastarch. When one of those completed he would be changed to an IV cocktail that included fluids and medication to help reduce his ventricular tachycardia. I left Smokey to find my way home. It was sometime after 5pm and already dark outside. Dr. Matz stayed with Smokey that night. She administered pain medication, antibiotics, and supportive therapy to Smokey. By 9:00 p.m. Smokey’s gums were pale again and his PCV was dropping. He seemed less responsive to Dr. Matz than he had earlier in the day. Another crisis was at hand. Again Smokey would need more blood. There was no available blood through the emergency clinics and there were no readily available greyhound donors. They needed Frankie, my younger greyhound and regular blood donor. When my home phone rang, I never heard it. I was sound asleep. My husband, Carm answered the phone. Ellie asked Carm if he would bring Frankie to the hospital. Without hesitation he replied that he would. I have to add here that Carm had never owned a pet before he met me. He was indoctrinated into pet ownership in an overwhelming manner. He’s learned quickly but is still sometimes hesitant in handling our pets for medical purposes. Oh, and the sight of blood makes him squeamish. When he so quickly responded to the call, he believed he was going to do just that – bring Frankie in for Dr. Matz to do whatever she needed to do and he would be home again before the next TV commercial. Carm deserves a medal for his participation in Smokey’s story. Not only did he restrain Frankie while Dr. Matz drew 500 mls of blood via a jugular vein, Carm “swirled” the blood in the collection bag to mix the anti-clotting agent and the blood. Through probably one of the most dreadful adventures in my husband’s life, I slept soundly. I did not hear husband and hound leave nor did I hear them return. I woke the next morning with Frankie licking my face, eager for me to see the bandage (his badge of courage) that he wore around his neck. My husband filled me in on the details. I called the hospital for an update on Smokey’s condition about 7 that Saturday morning. Dr. Matz and her family had spent the night beside Smokey in sleeping bags on the floor. Smokey maintained a normal body temperature during and after the transfusion and his hematocrit was steady. The donor and recipient were compatible. While this looked promising, Smokey’s was far from out of the woods. He suffered more consistent runs of ventricular tachycardia which was not abated by Lidocaine injections intravenously. He was unable to stand without assistance. By 7:30 that morning Smokey had started vomiting and more drugs were added to his list of medications. Standing under watchful eyes - 42 hours post op! Dr. Matz, Dr. Farrell, and I took shifts with Smokey during Saturday and Sunday. On Saturday afternoon while Dr. Farrell and I were administering Smokey’s medication, we brought Smokey out of his opened cage to a mat on the floor. He seemed more responsive and his PCV had not dropped. Dr. Farrell and I urged Smokey to his feet, supporting him carefully. Smokey seemed pleased, even proud to be on his feet. When Dr. Farrell and I let go, Smokey continued to stand. We watched him shift his body weight as if he were adjusting himself to a new pair of legs. Then, to our amazement, Smokey took several steps away totally on his own. We were thrilled and optimistic. We lavished Smokey with praise and immediately called Ellie to share the remarkable news. Fearful that we would over-tax his strength, we encouraged him back to his bed. In astonishment we watched as Smokey turned and repositioned himself in the cage. We were tickled. Although elated at Smokey’s progress, we did not lose sight of the fact that even on medication Smokey was still having ventricular tachycardia. Though he would drink small amounts, he had no appetite. By Sunday evening Smokey showed off for his visitors, Robin and Jonny and his mom, Ellie. With strategically placed floor mats, Smokey shuffled across the room in slow careful (sometimes guided) steps. He finally seemed interested in food. Unfortunately, only ginger snaps and sugar cookies, not the nutritious diet we wanted him to have. Still, we were pleased that he was showing a mild interest even though it was short-lived. After a few ginger snaps, he turned up his nose up at the smorgasbord of goodies and treats his visitors brought. The next afternoon it was decided that our sensitive greyhound was growing tired of his cage bed. He ate sporadically but drank eagerly. We mixed Nutrical, a nutritional supplement, in his water, but we fooled him only a few times before he began to inspect his water before he drank. He still favored ginger snaps over anything that resembled substantial nutrition. His ECG still registered an arrhythmia with periods of tachycardia, but we began to notice that when he was alone or with Ellie his ECG displayed a more regular rhythm. We decided that Smokey would probably recover more rapidly in his own home, in his own bed so we began to prepare for his discharge from the hospital. We walked Smokey through the back door of the hospital to save him from the terror of the traffic noises and he did perk up when he saw Ellie’s van. His enthusiasm quickened his unsteady steps. He knew he was going home. Once in the van, Smokey seemed more than happy to sleep on the dog bed, but coaxing him out and into the house took only minor effort. The medications that Smokey had been prescribed for his recovery created a cocktail that was tough on his digestive system so Dr. Matz added a Carafate slurry to the mix, hoping that this would settle his stomach. Everyone was eager to see Smokey eat, but Smokey kept everyone waiting. Ten days post op Smokey stood at his elevated dog dish and ate a small amount of his own dog food for the first time and from that day forward, he made a remarkable recovery. Although his hematocrit was still a bit lower than we all wanted it to be, it was consistent from blood test to blood test. Tick titers reassured us there were no strains of Ehrlichiosis or Babesiosis in our spleen-less wonder. He does have diminished sight in one eye, possibly the result of a blood clot. But as his appetite improved so did his strength and interest and delight in play. The biopsy report showed no malignancy. Smokey, somewhere along the way, had injured his spleen causing a hematoma to form. With time the mass encapsulated, grew and ruptured with Smokey’s twisting slide in the muddy yard.